Jack Bell Gallery is pleased to present a body of new sculptures by Gonçalo Mabunda. For the artist’s fifth solo exhibition with the gallery, Mabunda draws on the collective memory of his country, Mozambique, which has only recently emerged from a long and terrible civil war. He works with arms recovered in 1992 at the end of the sixteen-year conflict that divided the region. Mabunda was born in 1975, in Maputo, Mozambique. 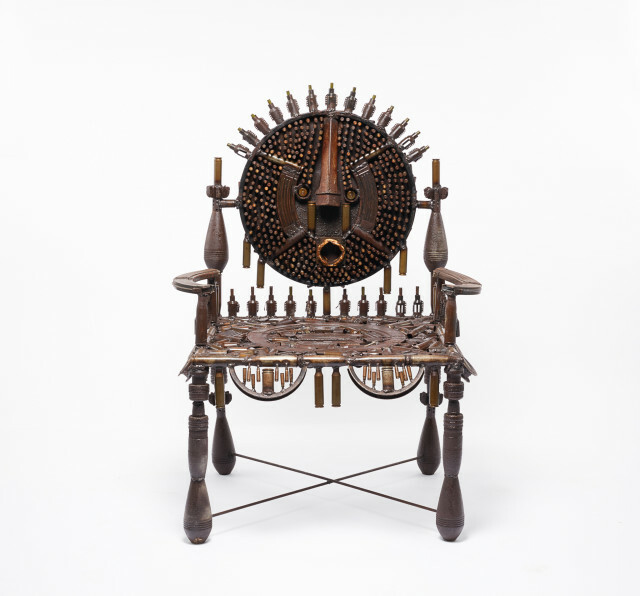 A mask has recently been acquired by the Minneapolis Institute of Art, USA. Earlier this year, a group of sculptures were exhibited at the Gangwon International Biennale, South Korea. His work is currently included in a group exhibition at the Albuquerque Museum, New Mexico. Previous group exhibitions include ‘All the World’s Futures’ at 2015 Venice Biennale, and ‘Making Africa’ at the Vitra Museum, Germany, among others.